The Democratic Party honors Martin Luther King Jr. and his legacy of fighting racism, giving hope to communities and his call for politicians to do what is right–end poverty, ensure a living wage, and access to health care for all. Martin Luther King Jr. Day is often called a Day On, Not a Day Off to embody Martin Luther King’s call to service. Democrats are also participating in voter registration drives on Jan. 15 at Grand Island Senior High from 12pm-3:30pm and the Central Community College in Grand Island from 11am-2pm. 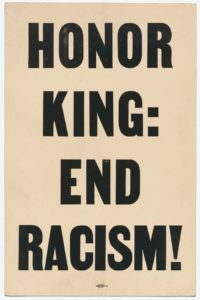 The poster below is from the Smithsonian National Museum of African American History and Culture’s collection of items from the Poor People’s Campaign when communities took over the National Mall with an effort to push for policies for working-class families.